Big News and Another Big Giveaway! Happy holidays! I hope you are having a good holiday season and that holiday/end-of-season stress is minimal. Today, I have some more exciting book news to share and information on several more giveaways I'm participating in this month, including a $500 Amazon Gift Card giveaway. Read on for details! Dear Robot Giveaway on Goodreads: There's only one more day left to enter the Goodreads giveaway for Dear Robot, an anthology containing my story, "Welcome to OASIS." Dear Robot is a collection of 19 science fiction stories presented as episalatory documents - emails, transcripts, instruction manuals, and in the case of "Welcome to OASIS," a government website tutorial for surviving the incursion of an alternate reality. Dear Robot is now available in paperback from Amazon and book sellers everywhere. 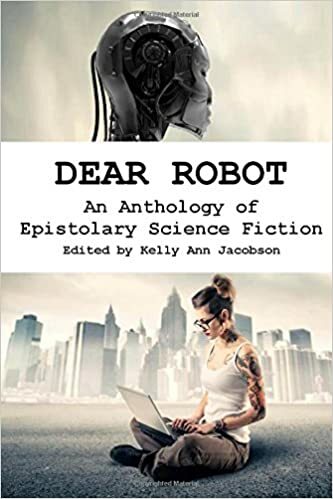 DESCRIPTION: Dear Robot is an anthology of nineteen science fiction stories told in a variety of epistolary styles. Letters, scientific notes, manuals, and emails all tell different stories about the future. From a behavioral contract for interstellar exchange students to a transmission from an astronaut in space, these sometimes humorous, sometimes heartbreaking stories all use their structure to amplify their message—especially when that message is that a band of deadly robots are chipping away at the door. Mocha Memoirs Press Blog Tour: From December 7th to the 14th, Mocha Memoirs Press is promoting their holiday romance titles with a blog tour. Each participating site has a post about the holidays - mine is about my favorite Christmas movies. Stop by my blog to check out Mocha Memoirs Press's holiday romance titles and to share your list of favorite holiday movies. Be sure to enter the $10 Amazon Gift Card giveaway as well. The audio book of Hereafter is available for sale at Audible! That's right! In addition, it will available through Amazon and iTune within a couple of days. I want to thank the incredible Amy B. Martin who narrated the book - she nailed Irene and Jonah, especially each character's vulnerability , perfectly. I didn't cry while writing the book, but I did cry listening to the audio book version. I hope you enjoy listening to it as much as Amy and I enjoyed producing it. 'Tis the Season Blog Hop: The fabulous 'Tis the Season Blog Hop is still going on - now through December 15th. More than 50 blogs are participating (including me!) and each one is giving away a prize worth at least $25. Stop by my blog any time between those dates to enter my giveaway (for a SIGNED three-pack of paperback books) and to find the links to all the other giveaways. You can enter as many of the giveaways as you want (enter them all!) and there is no limit on how many prizes you can win (it's quite possible one person could win all the prizes). $500 Amazon Gift Card Giveaway: I'm participating in/sponsoring The Kindle Book Review's $500 Amazon Gift Card Giveaway. No purchase necessary to enter (following me on social media gets you a free entry!) but buying a copy of Hereafter gets you a bonus entry and helps to boost Hereafter's visibility, so please go ahead and snag a copy. If you already have it, you can always buy a copy as a gift to a friend. Books make great holiday presents! 2015 Christmas Advent Calendar: And if you need any Christmas present ideas (for yourself or others), stop by Beck Valley Books & More's "2015 Christmas Advent Calendar." Every day between now and Christmas, Sharon will open another "door" on her advent calendar to reveal another featured book and a guest post by the book's author about their favorite part of Christmas (Hereafter and I were featured on December 6th - if you missed it, you can still visit the post to learn about my favorite parts of Christmas). Upcoming Appearances: I will be signing and selling books at the Manchester In-Town Holiday Market on Saturday December 12th and I will be appearing at Arisia (Boston, MA) January 15-18, 2016. Whereafter Cover Reveal Coming Soon: And last, but not least, I'm entering pre-release mode for Whereafter, which will be coming out in early 2016. I'm booking bloggers for an upcoming cover release tour - if you're interested, please let me know and be sure that you've signed up for my blogger newsletter. I'm also looking for street team members; you can sign up to join via the "newsletter" link on my website home page. As always, please share this newsletter and information on any of my giveaways and promotions.